Trucks are clearly being used as more than just tools to haul and explore, and today that means that there are LOTS of great options out there. 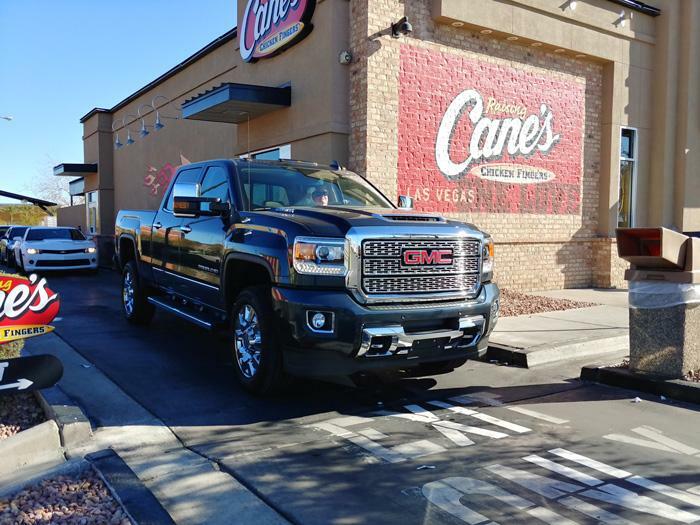 Last month, we got the chance to test out one of the best - GMC's 2018 Sierra 2500 Denali HD. Our route would be the five-hour road trip from San Diego to Vegas, plus a few detours! While I would have loved to test out the truck hauling some toys into the desert, this wasn't that kind of trip. Instead, we were looking for something that would look good pulling up to the valet and cruising the strip - but still be capable of cruising down some back roads through the desert. 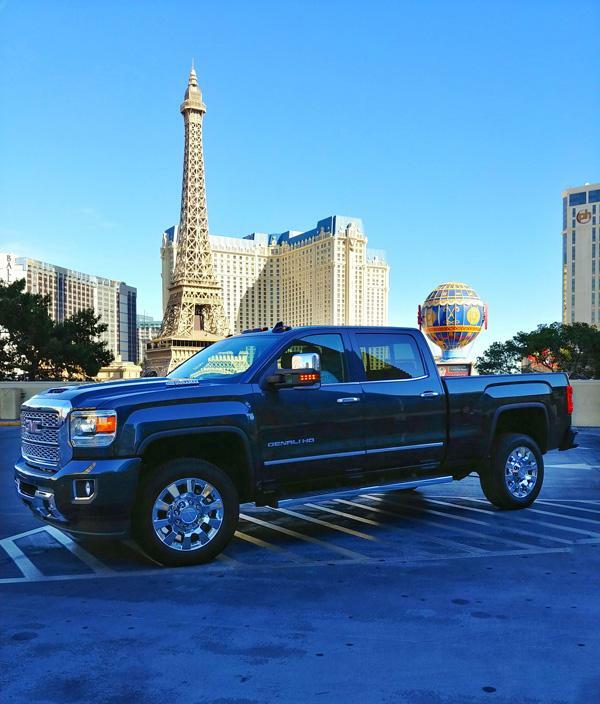 The Sierra 2500 HD Denali model we tested topped out at just over $70,000. Under the beautiful exterior with just right amount of shiny chrome, it features a 445 hp Duramax 6.6L Turbo-Diesel V8 for a conventional towing capacity rated at 13,000 pounds. There's also the long bed version that brings your total towing capacity to 14,500 pounds; 3500 HD brings it up to a max of 20,000. Towing numbers here are just shy of the leader - the Ford Super Duty, but offers the segment's highest diesel horsepower rating. The first thing I noticed from my initial walk around is that it was very well built. 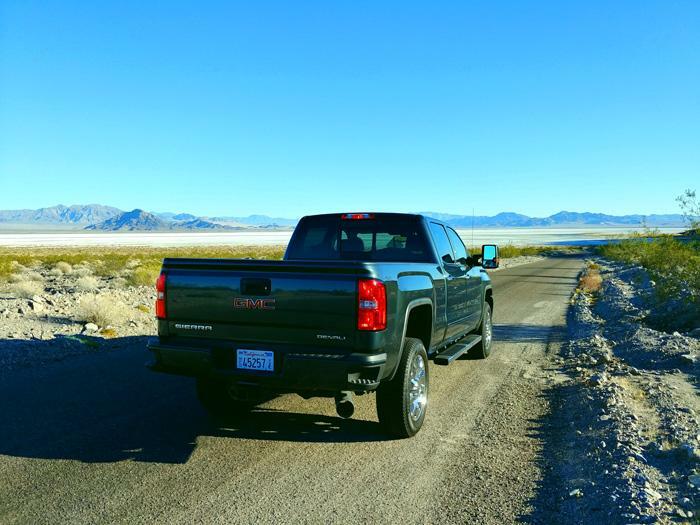 Granted, this was a brand new truck with under 3,000 miles on the odometer but you can tell that this is a different sort of General Motors product than you might expect from just a few years ago. Inside the cab, you'll find a solid tech package that includes an 8-inch IntelliLink navigation system, 4G LTE connectivity with WiFi Hotspot, heated and vented seats, wireless device charging, a 7-speaker Bose audio system with Android Auto and Apple CarPlay. Safety features include a Driver Alert Package that includes Lane Departure Warning, Forward Collision Alert, Front as well as Rear Parking Assist and a rear-view camera. 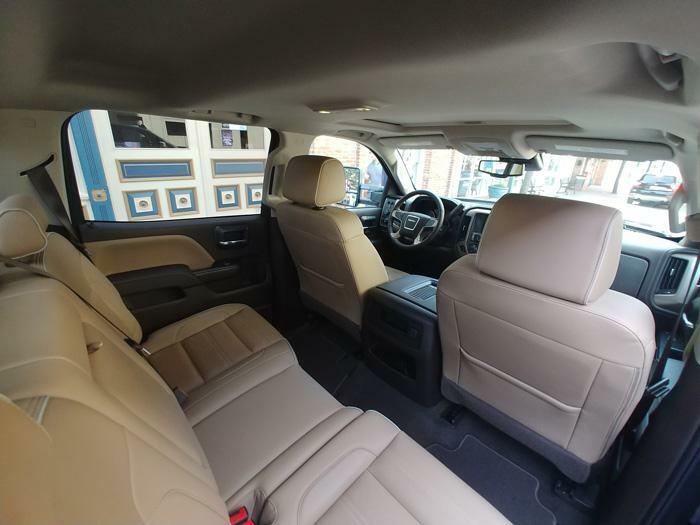 In short, if you are looking for a work truck with many features that you enjoy in an SUV - the Sierra 2500 HD Denali's got you covered. 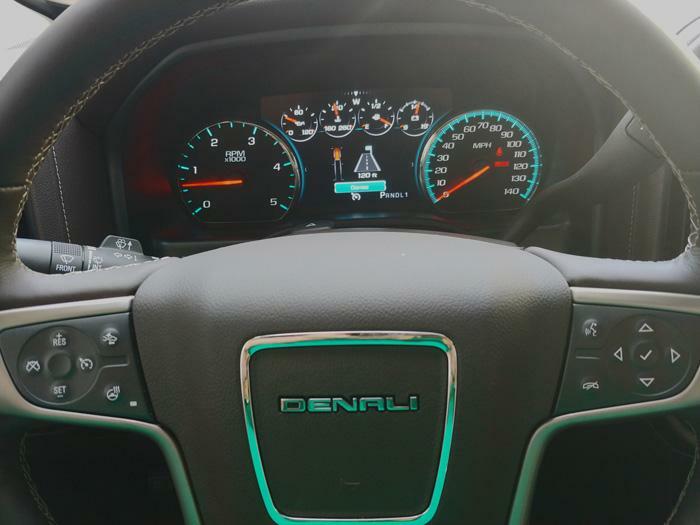 While some trucks edge farther forward into a true "luxury" feel, the Sierra 2500 HD Denali felt comfortable and well designed. For a long road trips though, I'd have liked seats with more support. However, everything here is designed for functionality and was very well laid out. That includes the instrument console in the dash to the gauges in-front of the driver. For a road trip covering more than 700 miles out and back, I was initially a tad nervous about how much money I'd be spending to keep this 7,462 pound truck on the road. However, I was surprised to find that between the 36 gallon tank and limited traffic, we made it to Vegas on about half a tank. Despite the fact that we were traveling at top highway speeds up and down hills, we rated a very respectable 17.9 mpg (there are no official numbers since HD trucks are unregulated). It was also surprisingly quick, especially for a diesel too. While it's not going to win any drag races with a Corvette, I was surprised at how quickly it managed to get up to speed on highway entrance ramps as well as having power when you needed it to switch lanes at highway speeds. With my fears of my wallet running out of money before reaching the casino floor, my next fear was would it fit in a parking garage space. With some previous large trucks that I've reviewed, this and navigating takeout window stalls had been a challenge. There's no way to get around the fact this is a big truck. However, it fit just fine in parking spaces in Vegas - and while TIGHT even in spots that I parked it in back home in San Diego. Additionally, it has a lot of lights on it, so it looks pretty cool at night too! At one point during this trip, I thought for sure that I had put a mark on the fender (was a can that I crushed, not the bumper though!). Drive-through lanes are tough for big trucks. Between the tight turns and the need to be close to the window to get your order it's a task that I've previously chosen to avoid and instead walked into the store to pick up my order. The Sierra 2500 HD though was surprisingly easy to manuever and the sides of the truck were exactly where you'd think they were from the cab. While towing is important it a big truck - making sure that it stays looking great is just as important and when you are hungry, the last thing you want to do is fear dinging a fender! 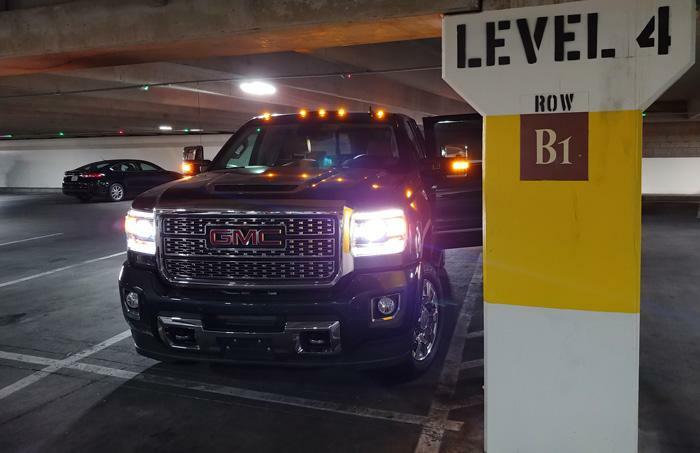 Overall, I was very impressed with the 2018 GMC Sierra 2500 HD Denali. It's a great work truck that is perfect for hauling your camper off on weekend getaways or towing your toys to the desert for some play time. However, it's "driver friendly" enough to be a great car to drive to work and even pickup clients in.